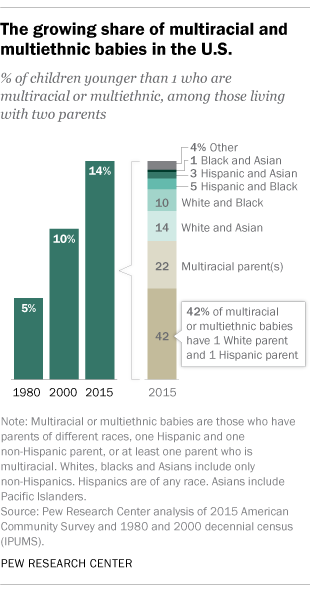 The rise of multiracial and multiethnic babies in the U.S.
One-in-seven U.S. infants (14%) were multiracial or multiethnic in 2015, nearly triple the share in 1980, according to a Pew Research Center analysis of Census Bureau data. This increase comes nearly a half century after the landmark Supreme Court case Loving v. Virginia legalized interracial marriage. Multiracial or multiethnic infants include children less than 1 year old whose parents are each of a different race, those with one Hispanic and one non-Hispanic parent, and those with at least one parent who identifies as multiracial. This analysis is limited to infants living with two parents because census data on the race and ethnicity of parents is only available for those living in the same home. In 2015, this was the case for 62% of all infants. The rapid rise in the share of infants who are multiracial or multiethnic has occurred hand-in-hand with the growth in marriages among spouses of different races or ethnicities. In 1980, 7% of all newlyweds were in an intermarriage, and by 2015, that share had more than doubled to 17%, according to a recently released Pew Research Center report. Both trends are likely spurred in part by the growing racial and ethnic diversity in the U.S. The general public seems mostly accepting of the trend toward more children having parents of different races. In a 2015 Pew Research Center survey, 22% of U.S. adults said more children with parents of different races was a good thing for society, while half as many (11%) thought it was a bad thing. The majority (65%) thought that this trend didn’t make much of a difference. Among all multiracial and multiethnic infants living with two parents, by far the largest portion have one parent who is Hispanic and one who is non-Hispanic white (42%). The next largest share of these infants (22%) have at least one parent who identifies as multiracial, while 14% have one parent who is non-Hispanic white and another who is Asian. The share of infants in two-parent homes who have parents of different races or ethnicities varies dramatically across states. For example, 44% of infants in Hawaii are multiracial or multiethnic. Shares are also high in Oklahoma and Alaska (28%). 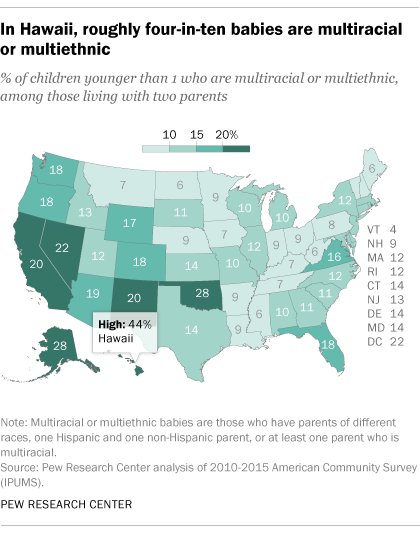 At the same time, just 4% of children younger than 1 in Vermont are multiracial or multiethnic, as are 6% of those in North Dakota, Maine, Mississippi and West Virginia.